In some scientific literature, the term "cod icefish" is used to identify members of this family. This should not be confused with the term "icefish," which refers to the "white-blooded" fishes of the family Channichthyidae. See Icefish (disambiguation). The notothens or cod icefishes are the family Nototheniidae of acanthopterygian fishes. They are traditionally placed in the order Perciformes together with their relatives, but like every lineage in the order, actual phylogenetic relationships among these species have not yet been determined with certainty. Notothens are largely found in the Southern Ocean and are particularly abundant off the coast of Antarctica. As the dominant Antarctic fish taxa, they occupy both sea-bottom and water-column ecological niches. Although lacking a gas bladder, they have undergone a depth-related diversification, such as increased fatty tissues and reduced mineralization of the bones, resulting in a body density approaching neutral, to fill a variety of niches. The spleen may be used to remove ice crystals from circulating blood. As the chilly Antarctica and sub-Antarctic waters of the Southern Ocean average −1 to 4 °C (30–39 °F), most species of these regions produce antifreeze glycoproteins to prevent the formation of ice crystals in blood and other body fluids. Some species exhibit polymorphism, for example, the circum-Antarctic Trematomus newnesi exists as two morphs in the Ross Sea, the typical morph and a large-mouthed/broad-headed morph. 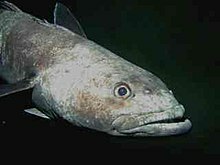 As the major fish resource in the Southern Ocean, many notothens are under increasing pressure from commercial fishing, particularly the Patagonian toothfish and the Antarctic toothfish. Wikimedia Commons has media related to Nototheniidae. ^ Froese, Rainer, and Daniel Pauly, eds. (2014). "Nototheniidae" in FishBase. February 2014 version. ^ Near, TJ; et al. (2004). "Phylogenetic investigations of Antarctic notothenioid fishes (Perciformes: Notothenioidei) using complete gene sequences of the mitochondrial encoded 16S rRNA". Molecular Phylogenetics and Evolution. 32: 881–891. ^ Gon, O and Heemstra, PC (1992). "Fishes of the Southern Ocean". The Quarterly Review of Biology. 67: 220–221. ^ a b Eastman, Joseph (1993). Antarctic Fish Biology: Evolution in a Unique Environment. San Diego, California: Academic Press, Inc.
^ Vacchi, M; et al. (2017). The Antarctic Silverfish: a Keystone Species in a Changing Ecosystem. Springer International Publishing. ^ "Surface Temperature - NOAA's Science On a Sphere". National Oceanic and Atmospheric Administration. 2018. ^ Chen, L; et al. (1997). "Evolution of antifreeze glycoprotein gene from a trypsinogen gene in Antarctic notothenioid fish". PNAS. 94: 3811–3816. ^ JPEC Ltd (August 6, 2013) [December 9, 2012]. "Chilean Seabass." Monterey Bay Aquarium Seafood Watch. Monterey Bay Aquarium Foundation. This page was last edited on 21 March 2019, at 02:05 (UTC).